Every time I have to answer someone as to whether I think blogs need to exist on their own subdomain, or in a subdirectory, I opt for the subdirectory. Now despite Matt Cutts talking a lot about the subject he doesn’t say a whole lot. I’d rather have my inbound links pointing to a subdirectory on a domain I’m trying to rank instead of a subdomain. After all, if parasitic SEO were still super powerful, why don’t we see SERPs littered with BuyViaga.Wordpress.com and the like? Regardless of how you feel about it, you may be technically limited from putting your blog in a subdirectory. One use case is if your Ruby app won’t accept a WordPress installation in a subdirectory. 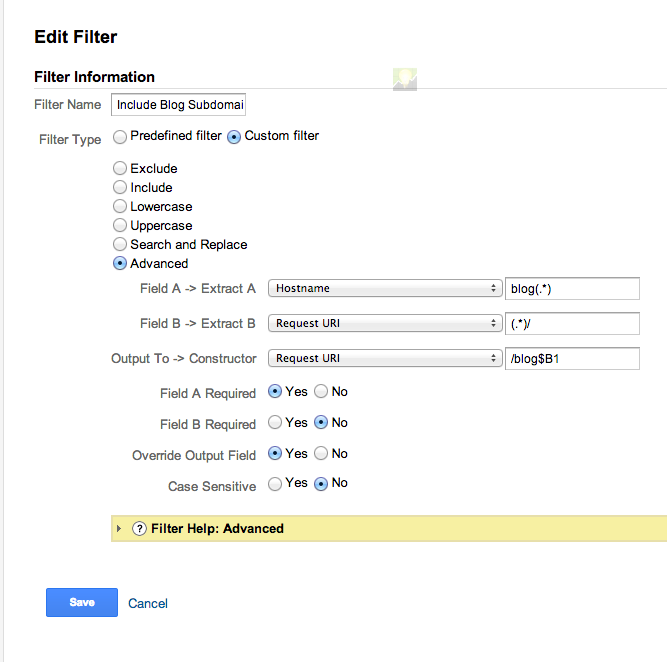 The advanced filter uses regex to reconfigure that data that goes into the analytics profile. Here, we look at Field A which looks to match any URL with blog in the hostname. That “activates” the filter, because we’re requiring this to match before anything else happens. Then the second field matches everything after the domain name. This would be the post URL. Then it finally outputs this data into the request URI. So it outputs your blog post URI with blog in front of it like so: /blog/post-name. This allows us to search for /blog to see how all our posts are performing. If we’re really interested, we can make a custom segment that looks for /blog and see our blog data in aggregate.